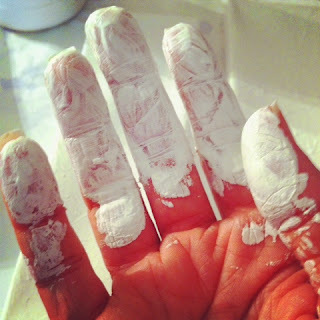 When I post about playing with gesso, I end up fielding a few questions about it. Since it's an art supply I use frequently, I figured I'd write an ode--or a blog post--about it. Gesso is an acrylic-based surface preparation. I use it to prepare all kinds of items for paint and/or decoupage. Coating a surface with a layer or two of gesso makes it ready for all kinds of media: watercolor, acrylic, decoupage, collage, pen work, etc. Smearing it all over a surface feels great! Now, if you prefer, you can avoid a mess by painting gesso on your surface with a foam or bristle brush. Painting it with a brush can feed meditative. But if you're like me, you get a tad impatient with that delivery method. Plus, smearing it all over a surface with my hands is a tactile experience. It reminds me of finger painting as a child. I remember starting preschool classes approaching the painting table, a little pile of silky tempura paint powder sitting atop a glob of starch on a piece of paper, just waiting for me to dive in with my fingers. I couldn't get my smock on fast enough to begin my masterpieces! Applying gesso to my painting surfaces brings some of that childlike joy back into my heart. Applying gesso is a fairly mindless yet mindful part of the creating process. Putting gesso onto a surface takes little strategic thinking. So I can really feel the gesso, the surface, and the rhythm of smoothing it out. I can be in the moment. Gesso is available at most hobby stores in the acrylic paints section. It comes in white, black, and clear. I recommend it highly for both the product and process of your creating!